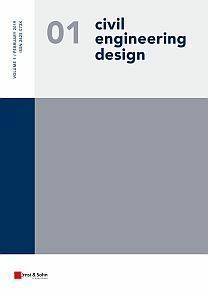 Civil Engineering Design is an e-only journal in English, based on Ernst & Sohn’s well-known journal Bautechnik. While maintaining the interdisciplinary and material-independent scope of the original, it focuses exclusively on scientific publications with short review and production times until published online. The aim is to promote a new format in scientific journals for construction engineering, design, maintenance, life-cycle behaviour, modelling and structural design with a material-independent approach across all engineering disciplines at international level. With Civil Engineering Design, Ernst & Sohn provides scientists with a speedy option to publish in an independent journal, bearing the needs of the international research community in mind. Civil Engineering Design deals with innovative theoretical, numerical and experimental methods for current and new building materials, such as concrete, steel, aluminium, glass, timber, masonry, composite materials, and all aspects of conceptual, structural and performance-based design, experimental testing and numerical modelling, including construction, maintenance and demolition, for the entire life-cycle of structures. The inclusion of geotechnical engineering and soil mechanics from a structural engineering perspective completes the picture. This interdisciplinary orientation allows the publishing house to address the scientific community’s growing need for opportunities to publish interdisciplinary research results in the field of construction engineering in the highly specialized international journal landscape. You are invited to actively participate in the launch of this new journal, shape it and determine its direction. Submit your paper via this link to ScholarOne.